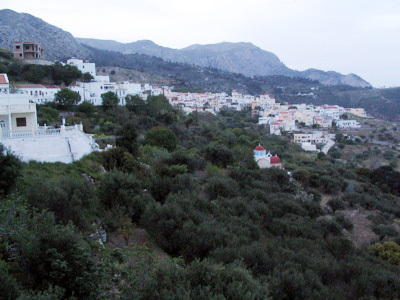 Othos is the highest village of Karpathos, about 12 km from Pigadia. The Folk Museum of Karpathos is located here, where you can see what a traditional Karpathian home looks like. Resident artist Mr. Yannis Hapsis offers his gallery of daily Karpathian life off the main road in the middle of the village. If you wish to grab a bite to eat and maybe catch the young people of the village playing Karpathian music on a whim, check out "Toksotis" Cafe which is directly across from the "Cambouris Mini-Market." If you happen to purchase anything from the neighboring "Papadia's Mini-Market," be aware that the priest's wife ("Papadia") is notorious for not giving proper change due to her age and poor eyesight.